Nostaglic post from Audrey Waters about the SRA Reading Cards of my childhood. First, Audrey Waters is awesome. She is even far more snarky than I am, and for that, I love reading her stuff. Second, this post traumatized me! But, caused me to think. Waters talks about the SRA program through the concept of personalized learning. She brings up B. F. Skinner’s “programmed learning” concept. Yup, that’s definitely what it was/is (I guess it’s still around). I totally see her point here: kids were often “rewarded” when they finished other work by getting to go to “THE BOX.” You read, answered questions, and checked it off, “DONE!” Then, on to the next one. Step by step. There’s no creativity, no freedom of choice. I can’t remember the questions about the reading, but I’m sure it was basic, low-level reading comprehension. She points out it’s often strong readers who loved this program, not the kids who struggled and were always reading the orange (or blue or green – whatever colors were the easier cards.) I can see that, too. Box of SRA reading materials, ca. 1973. 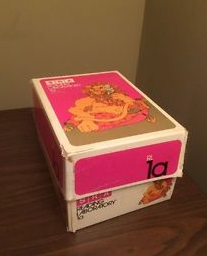 Image from an ebay posting. I see all this, and will look at SRA in a new light. Yet, I loved the SRA Reading program when I was a kid. LOVED. I mean it made me very happy to get to do SRA reading. Why? Because, for me, it was personalized. I got to go at my own pace. It was torture for me to sit through reading classes in the early grades. I had been reading on my own since I was three. Reading with a class caused me tremendous anxiety and frustration. I just wanted to READ. Not hear other kids learn how to read! With SRA, I could read as fast and as far ahead as I wanted, instead of getting told to stop reading ahead. Admittedly, this was something I could do very well and it got me strong positive feedback. So, why wouldn’t I love it? Thanks, Audrey, for that trip down memory lane!